WINDOW ROCK, Arizona – Chinese whistleblower Sun Xiaodi, earlier imprisoned and now under house arrest for exposing massive unregulated uranium contamination in China’s Gansu Province, was honored with a Nuclear Free Future Award 2006 for Resistance on the Navajo Nation. Although under Chinese surveillance, Xiaodi released an acceptance speech to the global awards hosted by the Navajo Nation on Dec. 1. Xiaodi, a former Project 792 worker, has been a whistleblower since 1988, urging the Chinese government to halt the corruption of its nuclear industry. 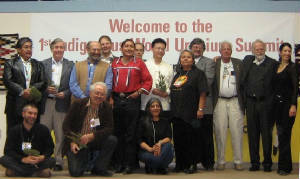 During the Indigenous World Uranium Summit, From Salzburg to Window Rock, Nov. 30 – Dec. 2, Xiaodi was honored with fellow heroes, Gordon Edwards of Canada for educational activism; Wolfgang Scheffler and Heike Hoedt of Germany for global solutions with innovative green energy reflectors and Ed Grothus of Los Alamos, N.M., for lifetime achievement for creative exposure of the nuclear industry. Special recognition awards were presented to Phil Harrison, Navajo, honored for his struggle for justice for Navajo uranium miners and the Southwest Research and Information Center in Albuquerque for the staff’s relentless struggle for environmental justice. Xiaodi sent his message to the awards ceremony in the Navajo capitol, where Navajos fighting new threats of uranium mining, gathered with 300 participants from 14 countries around the world, including Western Shoshone, Acoma Pueblo, Laguna Pueblo, Goshute, Pawnee and participants from Wind River, Wyoming, Australia, Brazil, Canada, India and Africa. Delivering Xiaodi’s message in Window Rock, Chinese activist Feng Congde of Human Rights China based in New York, said Xiaodi asked that his $10,000 award be kept for him, in hopes that he can someday be free to receive the award. From China, Xiaodi said in his message to the ceremony, “Since my release from detention, I have been in an extremely insecure situation in which I am threatened, intimidated and harassed. I felt tremendously honored and touched when I learned that I had been selected as this year’s Nuclear Free Future Award recipient, because I have seen the great power of world peace and development. “At the same time, I feel a deep sorrow, because I have also helplessly witnessed the environmental problems cause by the failure to effectively contain and reduce nuclear contamination. “Breaking through fear to fight for a nuclear free environment requires a person to take a path full of hardship, bloodshed and tears, which could end up in either life or death. Sun Xiaodi’s daughter, Sun Haiyan, said one month ago that her father is now under residential surveillance. Earlier, the Tibetan Autonomous Prefecture in China’s Gansu Province, was a region of green fields and pristine waters, its woodlands thriving with wildlife, is rich with uranium reserves, the award presentation stated. One of the largest uranium mining and milling installations to operate there was Project 792. Opened in 1967, Project 792, run by the military, annually milled between 140 and 180 tons of uranium-bearing rock until it was officially shut down in 2002, as bankrupt, owing to “ore exhaustion and obsolete equipment”. However, secretly rising from its radioactive ashes was a private mine operated by Longjiang Nuclear Ltd., its shareholders a brotherhood of politicians and members of the nuclear ministry. “Today, large sweeps of Ansu Province – dotted with sacred sites – appear to have succumbed to an overdose of chemotherapy. The Chinese have taken no preventive measures to protect local human and animal life from uranium contamination”, the award states. Tibetan medial workers report that an assortment of radioactivity-related cancers and immune system diseases account for nearly half of the deaths in the region. This remains among the “state secrets” and the patients' medical histories are manipulated to protect state secrets. Last year, on April 28, Xiaodi met with foreign journalists and told them about the frequent discharges of radioactive waste into Gansu waterways. He also told them about the Tibetan hitchhikers who climb up on trucks transporting uranium ore, happy for a ride. He also exposed that contaminated machinery was merely “hosed down” and sold to naïve buyers in Inner Mongolia, Xinjiang, Zhejiang, Human and Hubei. “These officials have blood on their hand”, Xiaodi said. The next day, plains clothesmen “disappeared” him. He was not heard from for months. Finally, mounting international pressure forced his release from Lanzhou Prison on Dec. 27, 2005. Xiaodi continued to speak out against Project 792. On April 4th, Xiaodi visited fellow petitioner Yue Yongjim in prison. Xiaodi found Yongjim emaciated from forced labor on a food allowance of only three steamed flour buns a day. Xiaodi joined a protest demanding Yongjim’s release. Xiaodi was again “disappeared”, and is now under house arrest. Navajos, like many Indigenous around the world, were sent to their deaths in uranium mines during the Cold War, without protective clothing. Today, after innumerable Navajo deaths from cancer and lung diseases, there are still 1,200 unreclaimed radioactive sites on the Navajo Nation. Further, there is the threat of new corporate uranium mining near Crownpoint, N.M., which, if allowed to proceed, would poison Navajos’ water source. Navajo President Joe Shirley, Jr., said, “As Diné people, we’re also looking for friends to help us defend ourselves against those who would break our laws to get at the uranium ore underneath our lands”, Shirley said during the Summit that continues today, Saturday, Dec. 2. “The heart of this movement is here,” said Norman Brown, among the Navajo organizers with the organization Dineh Bidzill Coalition. The Nuclear Free Future Awards were presented in cooperation with the Seventh Generation Fund and the International Physicians for the Prevention of Nuclear War, based in Germany. The Franz Moll Foundation for the Coming Generations presented the awards.